Welcome to Hough's Hair Specialists - with over 25 years experience as male and female hair loss specialists, we are one of the leading consultants in the West Midlands and have clients who travel from all areas fo the UK. Our services range from professional custom ladies wigs to hair replacement systems for men, including individually made to measure. If you are experiencing hair loss we are sure to provide the answer and solution for you. If you are experiencing hair loss - naturally or due to medical reasons - and are looking for the best non surgical answer to a full head of hair then we can meett your personal hair loss needs. Confidentiality is assured and consultations are carried out in private discreet cubicles, by either a male or female consultant. We have clients for all over the UK - not only from those near to Wolverhampton and the West Midlands. Over the last 25 years we have built a reputation for our quality of service and pricing structure - we offer a very high level of hair loss and hair replacement service at competitive prices. Whether you are looking for wigs wolverhampton or a full made to measure hair replacement system David, Claire, Maggie and Megan can meet all your needs. Hough's Hair has been in the city centre for over 30 years as has a very strong and good reputation in hair dressing and hair loss for men and women. We can supply systems for both male and female for a whole range of needs - including chemotherapy, alopecia, natural hair loss and even wigs for tribute artists. We are one of the longest established businesses in the Wolverhampton City Centre and have been established for over 25 years in Victoria Street, Wolverhampton. We have clients who travel to our salon from all over the UK. 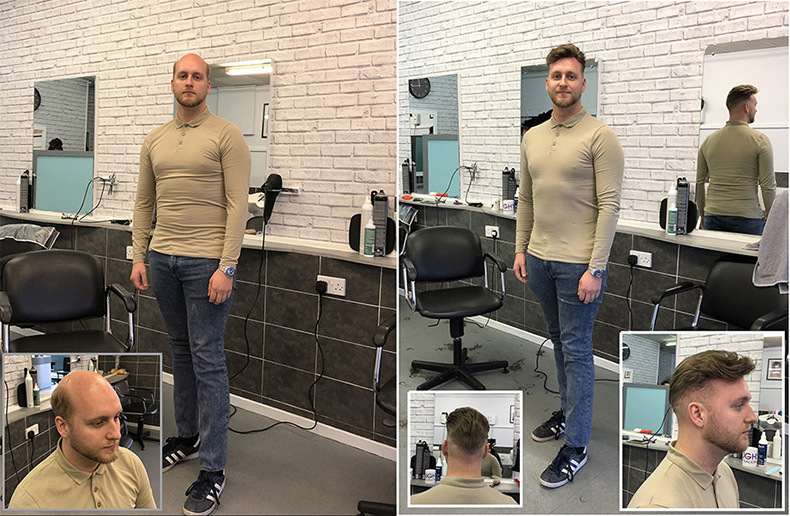 Finding the right specialist with the neccessary experience is the key to ensuring your hair replacement systems looks as natural as possible - we cut and style each system to ensure it looks natural and un-noticable. See what our clients have to say - click here. A system provides fantastic results - each is cut, coloured and styled to suit you to provide a full head of natural hair. Contact us today and ask for David, Claire or Gary. We offer the complete personal styling service for ladies wigs, including synthetic hair, human hair and lace front wigs. You may be experiencing hair loss due to medical reasons or looking for a ladies fashion wig. We can provide exactly what you are looking for - made to measure custom or budget of the shelf. Contact us today and ask for Maggie or Megan.